Flamenco still enjoys its place in Spain and can be found everywhere, even amongst the youth culture. There are about 30 varieties of Flamenco ranging from the Cante jondo (deep song), through to the duende (demon or elf). This is considered the ideal Flamenco. The origins of Flamenco go back to the 16th century and are mainly from the gypsies of Andalucia who developed this form of entertainment around the campfires. Every song tells a story ranging from love to history and politics. It is considered to be Spain's folklore music and combines music with dance, movement, feeling and meaningful song. The Flamenco that tourists are presented with in the coastal haunts is far from the true form of Flamenco with deep history, but at the very least its fun. its a lively presentation of beautiful music and dance in wonderful costumes. A taste of true Spain in whatever form you see it. Gypsies say its in the blood, but Spain's famous poet and writer Fredrico Garcia Lorca, called flamenco one of the greatest inventions of the Spanish people. The tragic lyrics and tones of flamenco clearly reflect the sufferings of the gypsy people. All over Spain there are thousands of 'fiestas' and 'ferias'; many of these involve flamenco and in most cases, flamenco dresses will be worn. 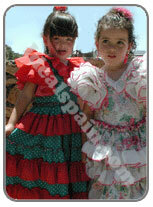 Spanish women will take every opportunity to wear colourful dresses and show off. Flamenco runs in the family. its part of of the culture of Spain. It's the colour and life-blood of Spain and its encouraged at an early age.